Metal Allegiance, a metal all-star concert and project started by Mark Menghi, asked friends to collaborate and pay tribute to recent and past artists at the Grove of Anaheim over NAMM weekend. They played tribute to “Fallen Heroes” like David Bowie, Prince and Lemmy with songs like Bowie’s “Suffragette City and Prince’s “Let’s Go Crazy”. 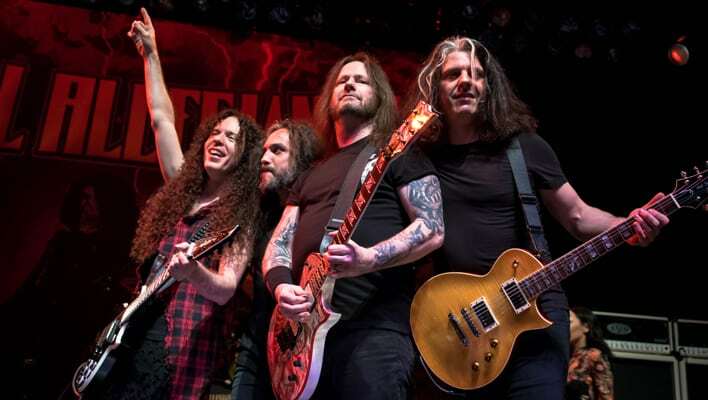 Metal Allegiance also played music of artists from the past such as Pantera, Metallica, Queen, Deep Purple and Ozzy Osbourne. Kicking off NAMM, this event was highly sought after by the media. In fact, there were so many photographers that we were divided into small groups to photograph three different songs each, while the event was simultaneously being filmed and streamed live. 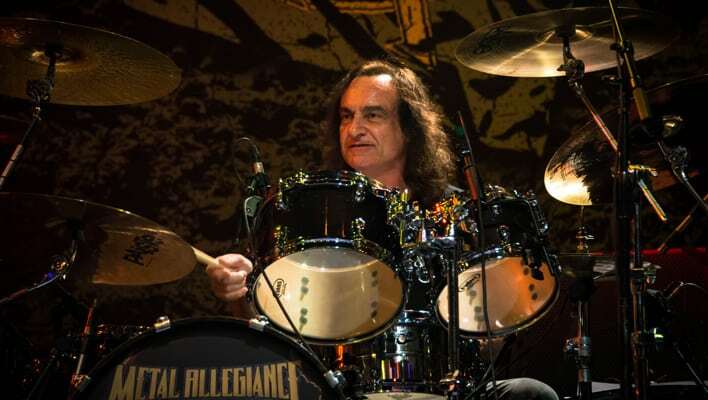 Metal Allegiance consists of artists such as Chris Jericho (Fozzy), Mark Osegueda (Death Angel), Phil Demmel (Machine Head), Alex Skolnick and Chuck Billy (Testament), Mike Portnoy (Winery Dogs), David Ellefson (Megadeth), Charlie Benante (Anthrax), Gary Holt (Slayer, Exodus) and many more artists contributed throughout the show. I was excited to be covering this event as I am also a huge fan of all of these artists. I waited my turn to get into the photo pit and ended up being able to shoot songs like “I Don’t Know” Randy Rhodes/Ozzy, “Was Ensemble” Jeff Hanneman/Slayer and “5 Minutes Alone” Dimebag Darrell/Pantera. Great songs! I couldn’t have asked for a better selection of three songs. The lighting and sound were great and any “Music Fan” would have enjoyed this lineup paying tribute. As the night continued, special guests Mikkey Dee drummer of Motorhead and Vinnie Appice drummer of Dio covered their own songs to pay tribute to their own singers that have passed. It was a great evening of great musicians paying tribute to their “Fallen Heroes” and I was pleased to capture the moments of the night. Menghi, who also plays bass in Metal Allegiance, continues to hold this event of all-stars in the Metal genre during the NAMM conference each year. Be on the lookout for this show every January in Southern California.